With Easter just around the corner, you may be looking for some ideas to share with the kids and the grandkids. It’s not too early to get started creating the Easter fun. This month each week I will share a fun ideas that you can do that will be creative and fun for all. 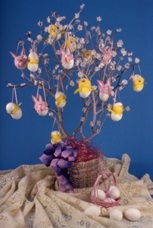 Once you create this fun Easter Egg Tree you can use it year after year. This is also great to do with the kids to create memories that last forever. This fun idea will be sure to please the little “peeps”. Spray paint the branch if desired. Mix the plaster in the plastic liner according to package directions. Insert the tree branch in the plaster and allow it to harden. Put the plastic liner inside the basket and cover the plaster with grass. Attach the flowers to the branch with glue gun. 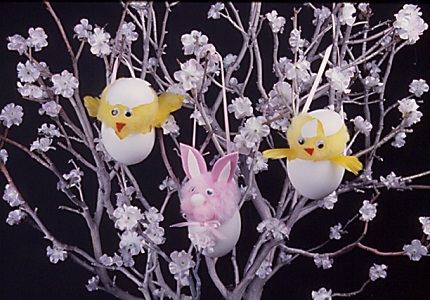 Hang Hatching Chick and Bunny Ornaments on the tree. Store these cute chicks and funny bunnies in an open egg carton inside a Styrofoam-popcorn-filled box. To make each ornament, hold an egg in your hand and tap firmly with a knife to crack the shell. Break the egg in half. Wash both halves of the shell and allow to dry thoroughly. Glue the ends of the ribbon inside the larger half of the eggshell on opposite sides to form a handle. Glue the head and body pom-poms together, and attach the eyes. Glue felt beaks on the chicks. For the bunnies, glue two small pink pom-poms in the middle of the cheeks. Glue the smaller white felt ears to the larger pink felt ears. Glue the ears to the top of the head. Set a completed chick or bunny inside the larger half of the eggshell. Glue the smaller end of the egg to the chick’s head to make it appear as if it were just hatching. Looking for idea like this to share with the grandkids? Get Dian’s IDEA PACKER library below. Dian Thomas’s Library: You will never run out of ideas when you have this wonderful set of books. Check out Dian Thomas’ Creative Books Library Special: She now had a special offer to save 60% on 5 books and 1 DVD. Get Dian’s creative library for only $40.00. Save $60 dollar and have over 25 years of her creative and amazing ideas. This package will be great for gifts, for fun, and for kids and grandchildren. Take advantage of this limited offer at www.DianThomas.com.